Published on July 19, 2017 in Lake Winnipesaukee Hotel. Closed Tags: lake life, Lake Winnipesaukee Hotel, nh hotel. The Center Harbor Inn is your key to living the lake life, and as they say; Life is better at the Lake. But don’t take our word for it, get out there and experience it for yourself. With direct access to Lake Winnipesaukee we bring the experience to you. Start your day off with our continental breakfast, grab a locally made bagel and fresh roasted coffee and head to your balcony where you can start out the morning with peace, serenity, and views of beautiful Lake Winnipesaukee. 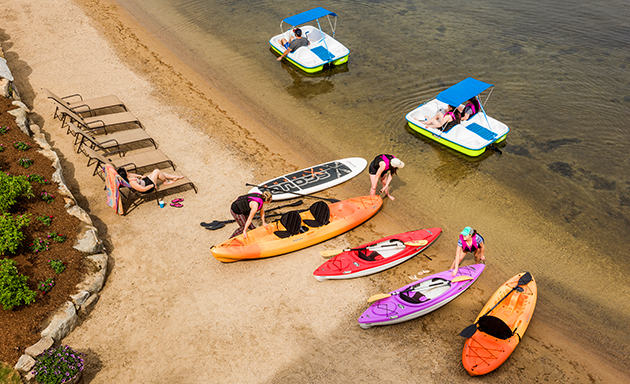 The Inn offers watercraft rentals that include: kayaks, paddle boards, and pedal boats. You don’t need a motor boat to enjoy life at the lake, it’s all about taking advantage of what is right in front of you. Spend the first part of your day exploring Halfmile and Mile island, the nearest of the 260 islands around Winnipesaukee. After a long morning of exploring the islands you must have worked up an appetite for lunch. So, walk across the street and grab a table by the windows at Mug By the Bay restaurant or go to Bellies – N – Butts for some Texas style BBQ take out and enjoy some savory ribs back on your deck overlooking the lake. Head back down to our nearly 200ft of sandy beach, grab a lounge chair, and settle in with a good book for a few minutes. After all you are supposed to wait 30 minutes after eating to start swimming again. Wade into the water for a refreshing swim and head out to the raft to bask in the sun for a bit. After a long day of being in the sun, go back to your room; take a nap, shower, and refresh for dinner. Center Harbor offers many dining options; walk to Lavinia Dining for a delicious meal inspired by local ingredients and a tasty IPA in the pub. For something more low key go to the EM Heath Supermarket to pick up some choice grilling meats and head back to the Inn to enjoy dinner using one of the lakeside grills we offer overlooking the bay. Post dinner, feel free to sit by the fire pit where there is always a fire going. Enjoy conversation amongst other guests who love the lake as much as you do. Don’t forget to do a late night hot tub session, there is nothing better on a cool summer night. After a long day, get ready for bed, sleep, wake up and repeat, lake life. Published on July 3, 2017 in Lake Winnipesaukee Hotel. Closed Tags: docks, Lake Winnipesaukee Hotel, moorings. Imagine waking up to beautiful views of Lake Winnipesaukee and grabbing a to go bag of locally baked bagels and freshly prepared coffee from our continental breakfast. Then picture yourself walking down to the hotel docks to board your boat for a day of cruising the pristine waters of Lake Winnipesaukee. One of the true natural gems of New England, a day of basking in the sun, tubing across the wake or waterskiing adventure will never be the same after your time on this amazing lake. Where else in the Lakes Region can you bring your boat on vacation without paying an overpriced nightly mooring or dock fee? 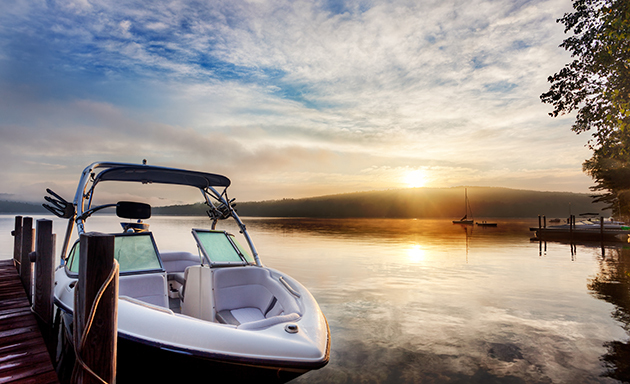 The Center Harbor Inn is the ideal destination for the avid boater. Right off our nearly 200 feet of sandy beachfront is a dock system that offers 16 Slips with an additional 8 Moorings further out. This unique hotel amenity allows guests to bring their own boat or rent one and keep it right on the property. The town boat launch is just a few hundred yards away and the inn also has an arrangement for trailer parking during your stay. 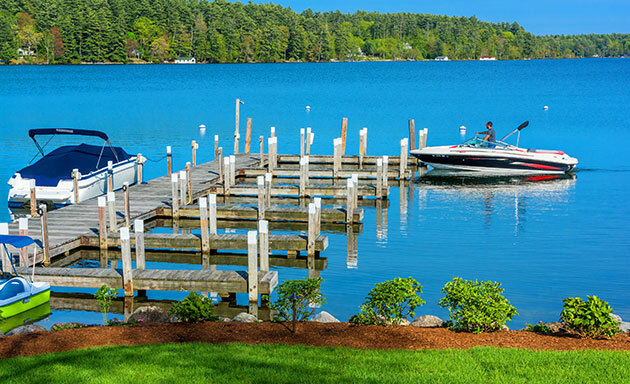 When it comes to boating getaways, the convenience available at the Center Harbor Inn is unmatched on Lake Winnipesaukee. Docks are currently available at $50 a night, and moorings are offered free of charge on a first come first serve basis. Even better, any guest staying for four or more nights qualify for our Boater’s Delight Package which includes the dock slip for free. At the Center Harbor Inn you can truly embrace all that Lake Life has to offer.